Composer Cheryl Leonard has an unusual take on the everyday sounds of nature. Taking objects and audio samples sourced from her trips around the world, she brings them together to create unique musical pieces. Antarctic penguin bones and 100-year-old shells, common stones and even sea salt are carefully manipulated to create sounds that eerily reflect the land they came from. We had a chance to hear her play these unlikely instruments and recorded sounds which together make for a compelling performance. It’s not easy to write about sound, so maybe it’s better to start with the objects that emit them. As part of a NSF program which invites artists and writers to explore Antarctica Cheryl spent 6 weeks in the extreme environment seeking unique sounds and materials that could make sounds. Her trip was the basis for a suite of compositions which she further elaborated on with a trip to the Arctic. The centerpiece of the performance is the Limpent Spine Instrument made from very, very long living Antarctic limpent shells which are assembled in an arrangement that is tonally scaled. Call it music on the half shell — bowed on the edges, the shells hum, or conversely brushed on the side they make a light scraping sounds. Salt trickling from a bottle set upside down cascades on a pair of granite stones, creating a background white rustling sound, changing pitch as the salt grains tumble onto each stone. The spine of an Adelie Penguin (removed from Antartica with permission) makes a wispy note evocative of wind when a string is pulled through it. An Adelie Vertebrae Mobile provides more acoustical texture. Even Pacific sea kelp is dried and turned into a wind instrument. As part of Front Range Community College‘s sound sculpture exhibition Sound Through Barriers Cheryl played her compositions, which are a mix of recordings and live instrumentation. The recordings were an eclectic array of soundscapes from a group of sleeping, snoring southern elephant seals (take a listen) to the reverberations caused by striking steel railings in an abandoned Russian city. The recordings set a base rhythm for the hand-made natural instruments to play off of. Cheryl’s compositions are methodical and deliberately paced, sometimes musical and at other times evocative of natural sounds emanating from distant, open places. It’s not easy to write about sound, so maybe it’s better to start with the objects that emit them. As part of a NSF program which invites artists and writers to explore Antarctica Cheryl spent 6 weeks in the extreme environment seeking unique sounds and materials that could make sounds. Her trip was the basiss for a suite of compositions which she further elaborated upon with a trip to the Arctic. The centerpiece of the performance is the Limpet Spine Instrument made from very, very long living Antarctic limpent shells which are assembled in an arrangement that is tonally scaled. 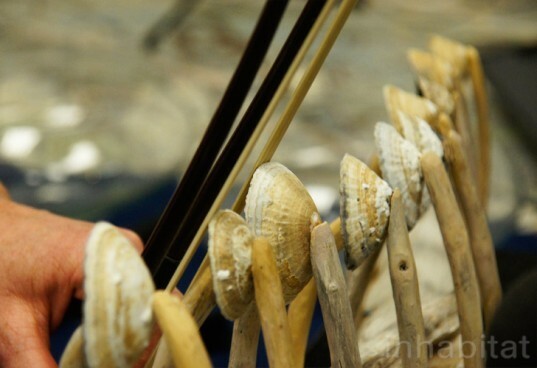 Call it music on the half shell—bowed, the shells hum, or conversely brushed they make a light scraping sounds. Salt trickling from a bottle set upside down cascades on a pair of granite stones, creating a background white rustling sound, changing pitch as the salt grains tumble on to each stone. The spine of an Adelie Penguin (removed from Antartica with permission) makes a wispy note evocative of wind when a string is pulled through it. An Adelie Vertebrae Mobile provides more acoustical texture. 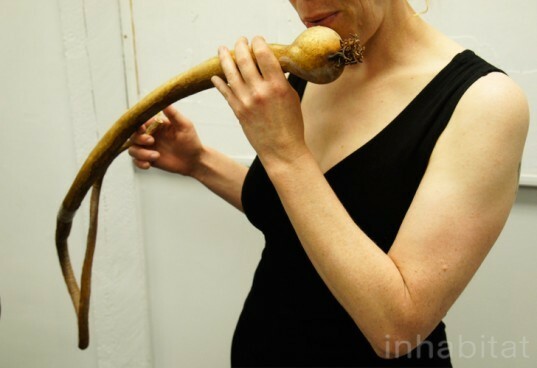 Even Pacific sea kelp is dried and turned into a wind instrument. As part of Front Range Community College's sound sculpture exhibition Sound Through Barriers Cheryl played her compositions, which are a mix of recordings and live instrumentation. The recordings were an eclectic mix of soundscapes from group of sleeping, snoring sea walruses (take a listen) to the reverberations caused by striking a steel railing in an abandoned Russian city. 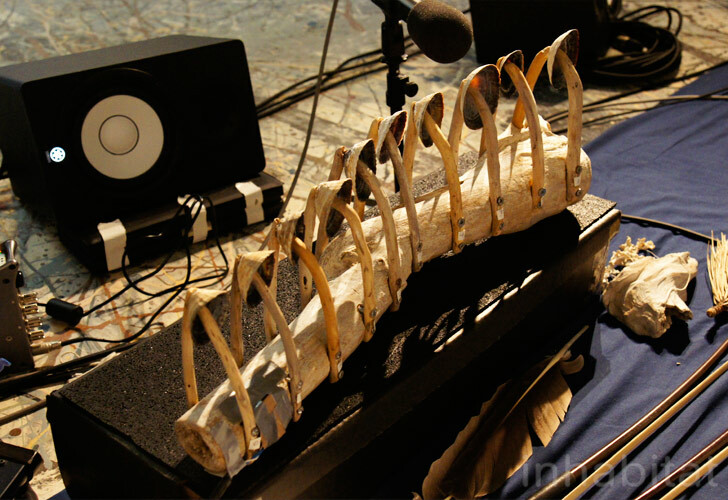 The recordings set a back drop rhythm for the hand-made natural instruments to play off of. Cheryl’s compositions are methodical and deliberately paced, sometimes more musical and other times evocative of natural sounds emanating from distant, open places.